The blurs and reviews generally say “heart-warming” and “life-affirming” and trite as they are, the words are certainly are true. Sometimes I like these kinds of novels, sometimes not. It has to be both the right book and the right time. A steady diet would be annoying. 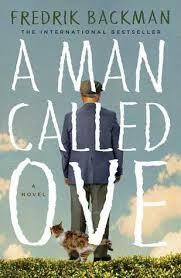 In this tale we have “A Man Called Ove” who is relatively young in the backstories, but now he’s one of those guys who “… has been a grumpy old man since elementary school.” Curmudgeonly, might be an apt word to describe Ove. He knows how to do everything the right way, the honest, decent, correct snd proper way – the way which “any dummy should know.” He gets this original moral steadfastness from his father, now deceased, but, it would seem, without his father’s humanity. Ove is a very negative person in general. But although Ova knows how to fix things, cars and houses, he really doesn’t know how to deal with people. I wonder if there’s a touch of Asperger’s. When the book opens in the frame story, his wife has died, he’s lost his job and he really wants very much to die. But he is having trouble with the neighbors over various things and the tale then slides into backstory, how did this come to pass? I hate spoilers so I’ll leave it at that. Bachman is a good storyteller developing interesting characters and a nicely twisted structure. The translation is adequate leaving the reader in Sweden, but with probably universal grumpy old man themes.